To be really, really honest about all the moron tax paid in a lifetime, we have to talk about love. We commit to love fully, blindly, and hastily. We go to great and desperate lengths to preserve it. Yet, more often that not, we find ourselves lavishing love on unworthy lovers, one after another, each time with equal sincerity. In other words, we give everything for love, often to the wrong people, and never learn our lesson. No conditions could be more ripe for moron tax. 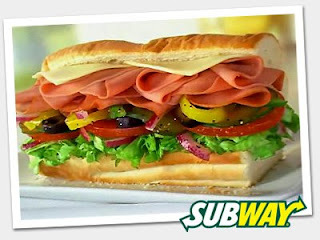 Take this example: Several years ago, on my way to pick up my (then) boyfriend from the airport, I stopped to buy him a Subway footlong sandwich. When we arrived at my apartment, he unwrapped the sandwich, took a bite, and said loudly and with disgust, "Is this a cold cut trio? What were you thinking? I was totally excited to eat this sandwich, and it turns out to be a cold cut trio. I can't eat this crap. It's like you go out of your way to be disappointing." I offer to cook or buy him something else, but he refuses, choosing instead to finish the sandwich and complain between each bite of my inattention, my lack of common sense, and the burden I'm imposing on him. Even after he's done eating, he drills on about how my choice of the cold cut trio reveals my weakness in character. Frankly, it's a tribute to his innate creativity that he could tie so much personal failing to a sandwich. I wordlessly sucked up his verbal assault. I even apologized. When his sister happened to call and overheard the situation, I defended him. At the time, I was so enamored with him that I saw the world through his eyes, which happened to always be trained on my faults. Behold the power of love -- it can transform deli goods into weapons and self esteem into ash. Sum of the moron tax: Two hours of my life wasted, $7.89 for the sandwich (plus chips and drink), and total loss of dignity. Of course, after already having dated this man for some time, I didn't have much dignity left to lose. *If you're wondering what is so offensive about a cold-cut trio, I have no idea. It has always looked edible to me. ** Take a look at Angela's comment to my last entry (Moron Tax in the Making). She submits a great moron tax story about how her alcoholic then-boyfriend drove her to such frustration that she tried to punch her hand through a wall. Yes, boyfriends are one of the leading causes of moron tax. One way to tell when you've paid way too much moron tax -- when you find yourself trying to explain (to your boyfriend) exactly what it is that weirds you out about the fact that your boyfriend has a stuffed penguin that he treats as one of his closest friends, and that he wants you to have conversations with the stuffed penguin. Not speaking from experience, or anything. hahahaha! i can totally see HIM doing that too! the same person who will go to portillos and order the cheesybeef, chilidog, grilled tuna. and feel self conscious eating all 3 in front of some random girls so he just eats 2, and wraps up the last one to eat in his car.